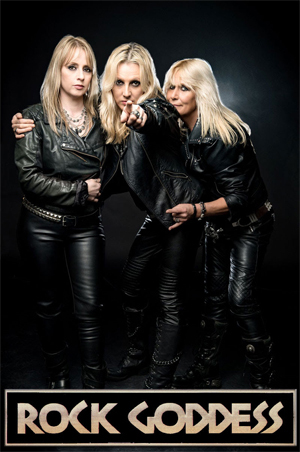 Legendary London trio ROCK GODDESS return with a brand new 3 song EP entitled It's More Than Rock And Roll which is set to be released on May 19th, 2017. Digital distribution via Cargo Records and physical CDs, with a 4 page booklet in a jewel case by ROCK GODDESS directly. The first 500 copies will be signed and numbered. Well, it's only taken them 30 years, but finally the original, classic ROCK GODDESS trio have released new product. Except that we should NOT see this three-track EP as a follow-up to the self-titled, debut album put out in 1983. Oh no, this is a complete affirmation that Jody Turner (guitar/vocals), Tracey Lamb (bass) and Julie Turner (drums) are fully relevant to the hard rock scene in 2017. So, if you are nestling down for a comfortable trip into the borough of Nostalgia, South London, then you had better be prepared to have this notion scrambled, and then served up with music that has a huge taste for contemporary aptitude and attitude. In the early 1980s, ROCK GODDESS made a reputation for delivering songs with full frontal riffs, snapping rhythms and snappy melodies. That hasn't altered. Since the three reunited in 2013, they've proven to be an energised, committed live band not reliant on past glories, but hell bent on the pursuit of an even more electrifying future. The EP is called It's More Than Rock And Roll, which is a statement of how committed the three are to their cause. Jody Turner wrote all the songs and also produced them, with Wes Maebe mixing and mastering the record. And the man has previously worked with a fine array of talents, including Roger Waters, Sir Tim Rice, The Buzzcocks and Beverley Knight. It's obvious what ROCK GODDESS have done in the studio is take their sharply honed instincts, using these to let rip with a clear-sighted, rousing momentum. "It's More Than Rock And Roll" itself is a mid-paced roaster that has genuine depth, yet a chant-a-long chorus to get everyone on their feet. The lyrics betray the GODDESS' complete immersion in the passion of this genre. The video for this song will premiere on Vintage TV at Nicky Horne's Friday Rock Show on April 21, GMT 22:00. "Back Off" sees the band locked into an assaulting groove, one full of a spirit born from that essential, yet so often elusive balance between virtuosity and aggression. "We're All Metal" not only name checks iconic artists across metal and rock's past and present, but is an anthem for all ages. From six to 96, it'll get everyone pumping out the horn sign! “It's been a long time coming, but we got there,” says Jody. “We are so proud of this, and of each other. We hope people enjoy it as much as we want them to.” Jody, Tracey, Julie – proud to be loud!